Call us on 01623 451 010 to arrange a free demonstration of the software. We have developed our own Concrete Batching Software which allows for the management of Ready Mix, Site Mixing, Precast and Screed/Mortar Plants. Our Concrete Batching Plant Software delivers optimal plant performance with a very easy to use interface, meaning a concrete plant can be managed using just a keyboard and a mouse. All of the daily functions that a plant operator would need are at their fingertips on the main display and more in-depth settings are securely protected. Plant operators will become very confident in using the Concrete Batching Plant Software package after just a short period of tuition. Our concrete plant software provides a scalable and cost effective solution by utilising off-the-shelf components which are easily obtainable. The Concrete Batching Software package allows your operator to control and monitor the entire concrete plant using just a keyboard and a mouse – allowing them to understand the performance of the plant and to spend their time efficiently. Our Concrete Batching Plant Software allows for fully automatic weighing and mixing, with either manual or automatic discharge from the mixer. If at any point any manual intervention is required, the system can be switched from automatic to manual easily and when it is switched back to automatic, it will pick up where it left off. All of the data from production is stored in a database, this allows for comprehensive reports to be generated and displayed as required with the ability to also filter reports. Reports can be set to run automatically or on-demand, as required. 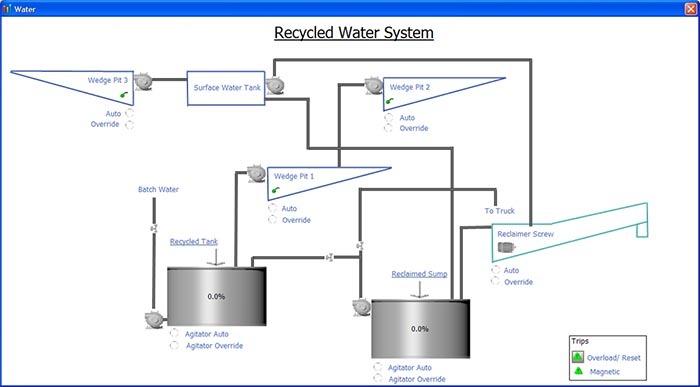 Our software makes use of realistic mimics that allow you to visualise the concrete batching process on your computer screen, allowing for swift diagnosis of issues and accurate batching. Please see below some screenshots of our software in action. We have engineered our Concrete Batching Plant Software over the years to be as flexible as possible in covering the needs of your plant. We have several core features that are standardised across all installations, but we’re also able to offer an array of optional features that are beneficial to different types of plant. Connect your own business system such as SAP to our system to receive loads (including recipes). These loads are then produced and the batched weights are sent back to the enterprise business system for analysis, reporting and storage. The interface makes use of RS232 or Ethernet standards for connectivity. Our system allows you to schedule the sending of reports via email. Single or multiple reports can be generated and they can be sent to a single email address or to multiple email addresses. This optional feature allows microwave moisture probes to be used for aggregate moisture measurement which can be connected to the system. This allows for easy calibration through our single or multi-point calibration procedure. This optional feature adds a printer to the system for the printing of despatch tickets. The design of the despatch tickets can be bespoke or from our range of standard layouts. The tickets can be printed on plain paper or pre-printed. Carbon loaded triplicate paper can also be used. This optional feature allows orders to be placed and scheduled. The orders can be for single or multiple loads. 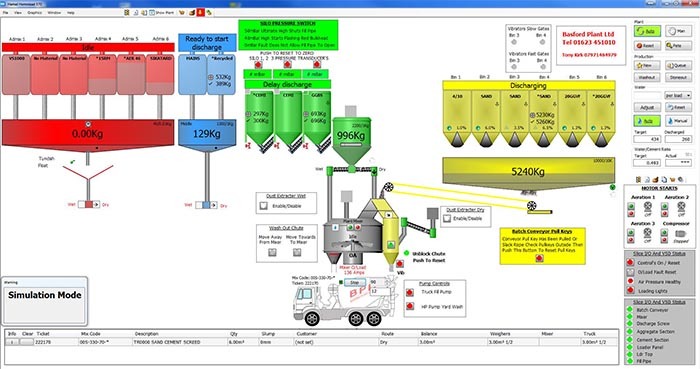 The status of each order can then be easily seen through the Concrete Batching Plant Software and a status can be assigned to the order (Ordered, Completed, Remaining load quantities). A report can then be generated for manual transfer to a financial package for invoicing or an invoice can be printed directly. Call us on 01623 451 010 and one of our team will be happy to arrange a demo of our software.